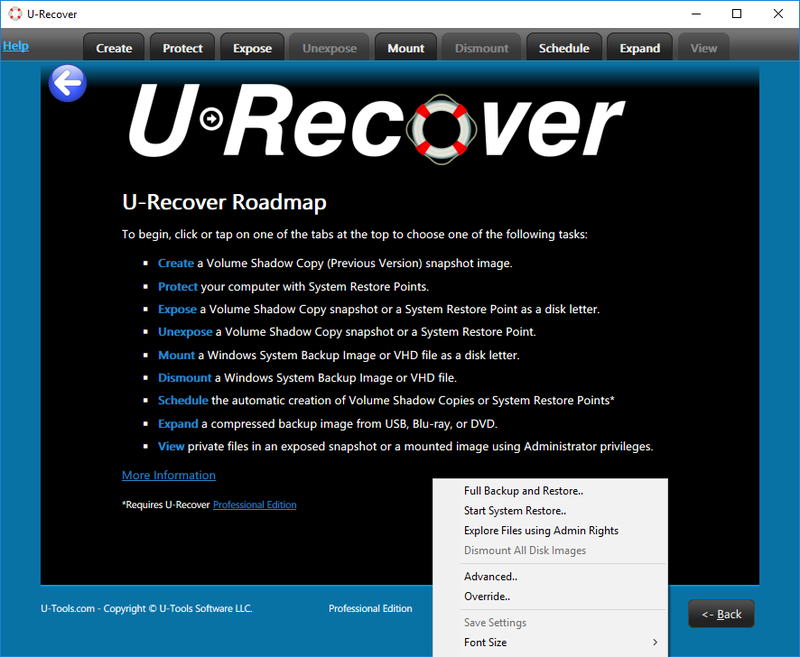 U-Recover brings back your favorite Microsoft® Windows® 7 file protection and recovery features on Windows 10. 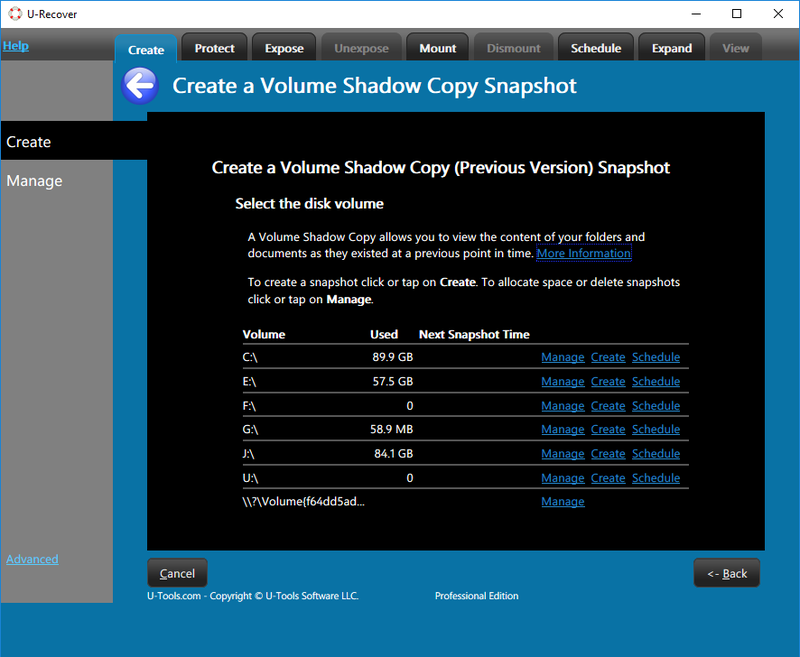 It lets you create and manage Volume Shadow Copies (Previous Versions) of your files inside of Windows Explorer just like you did on Windows 7. 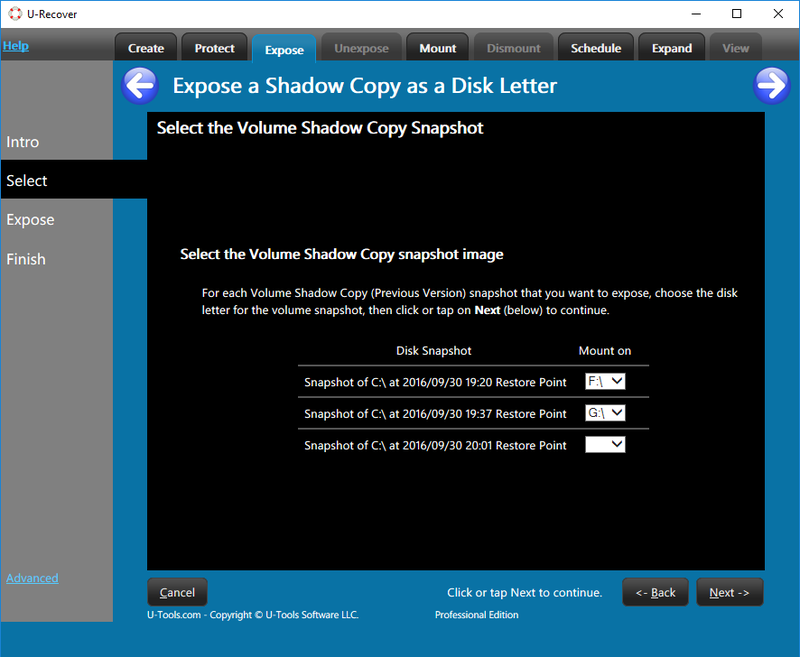 Starting with Windows 8, Microsoft replaced Volume Shadow Copies with File History. File History captures only your personal files and requires an external backup device. 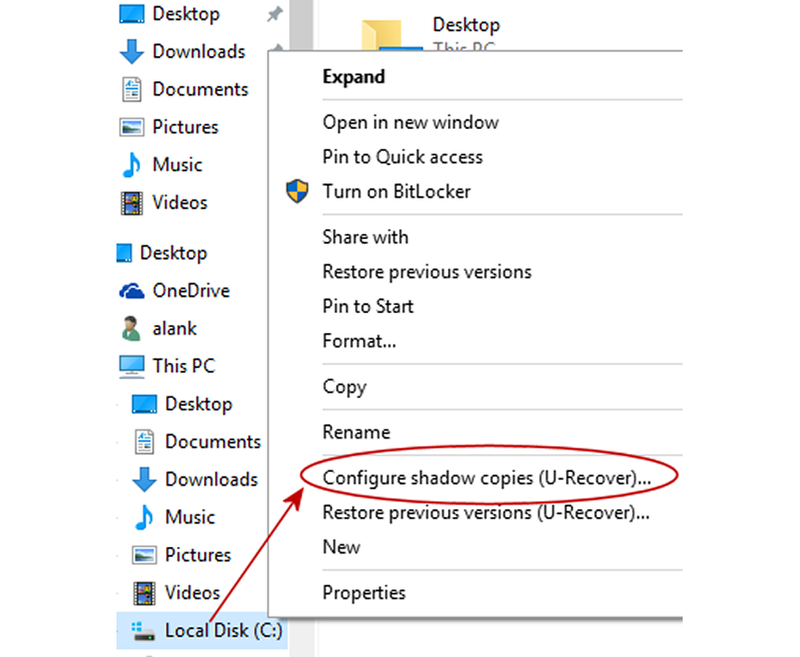 U-Recover gives you the ability to create and configure shadow copies in Windows Explorer on Windows 10 so that you can save old versions of your files. 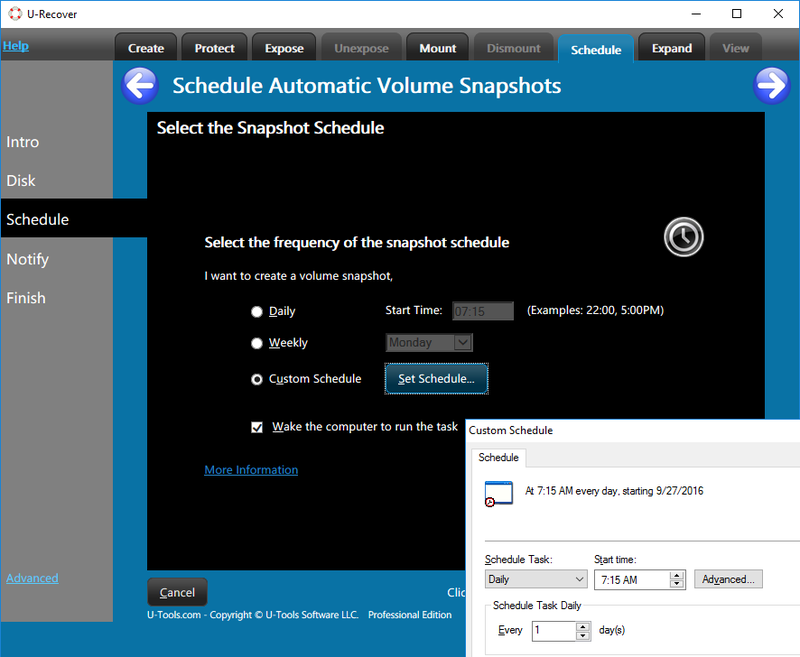 It also brings back the ability to schedule the creation of automatic daily snapshots or daily system restore points. None of these features are available on Windows 8 or 10. U-Recover gives you extra file recovery features that go beyond Windows. 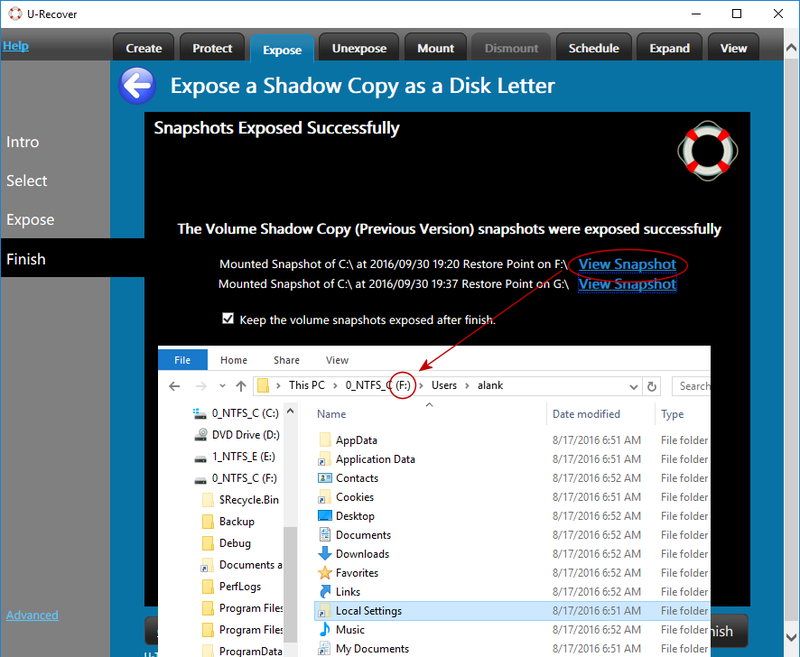 For example, you can expose a snapshot or a restore point as a disk letter in order to browse, search, or copy the files within it. 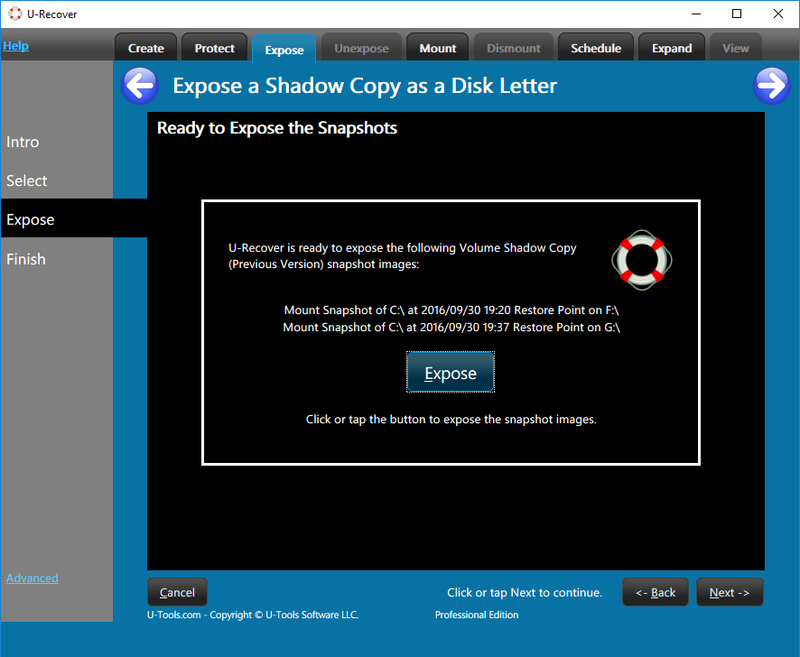 Because the snapshot is just another disk letter you can access all of the private files within it using your administrator rights, something that was not possible even on Windows 7. 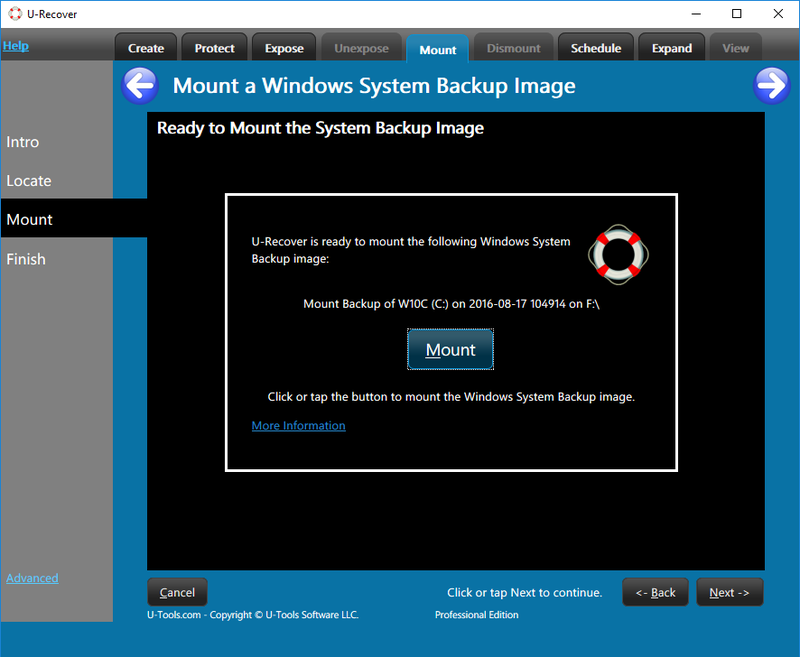 With U-Recover you can also mount a Windows System Image Backup as disk letter, including a compressed image, and browse it with full administrator rights (also not possible on Windows 7). U-Recover Pro gives you even more features for the enterprise. These include installing the software on demand, scheduling the automatic creation of snapshots or restore points (with e-mail alerts), and automating U-Recover to run using scripts or with Group Policy. Running Windows Server? See U-Move for Active Directory. In Windows 8, Microsoft introduced a new method for tracking changes to files called File History. File History copies your personal files to an external physical storage device (e.g., a USB thumb drive) or to a cloud service. For a detailed point-by-point comparison of File History vs U-Recover see File History compared with U-Recover. 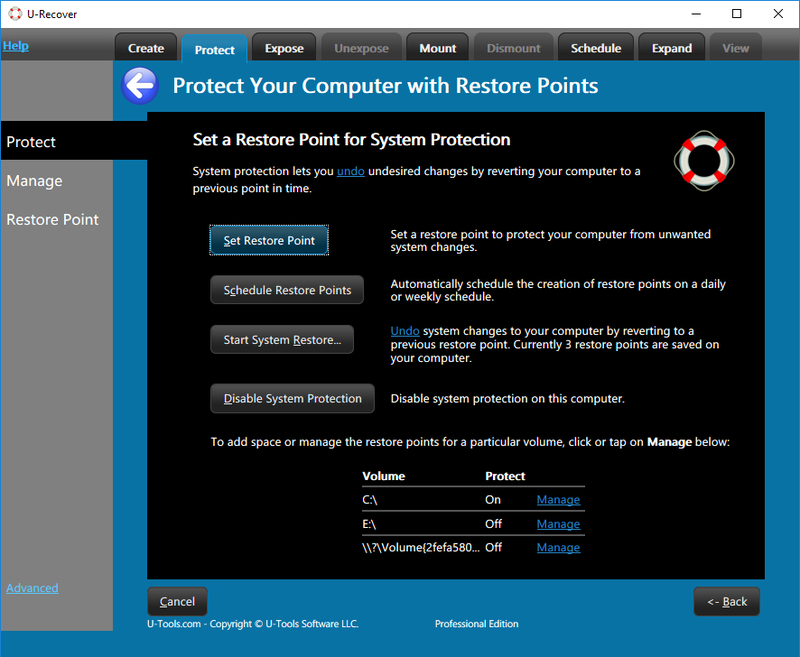 Recover user documents and files from inside a system restore point. Mount a System Image and compare it with the running system. 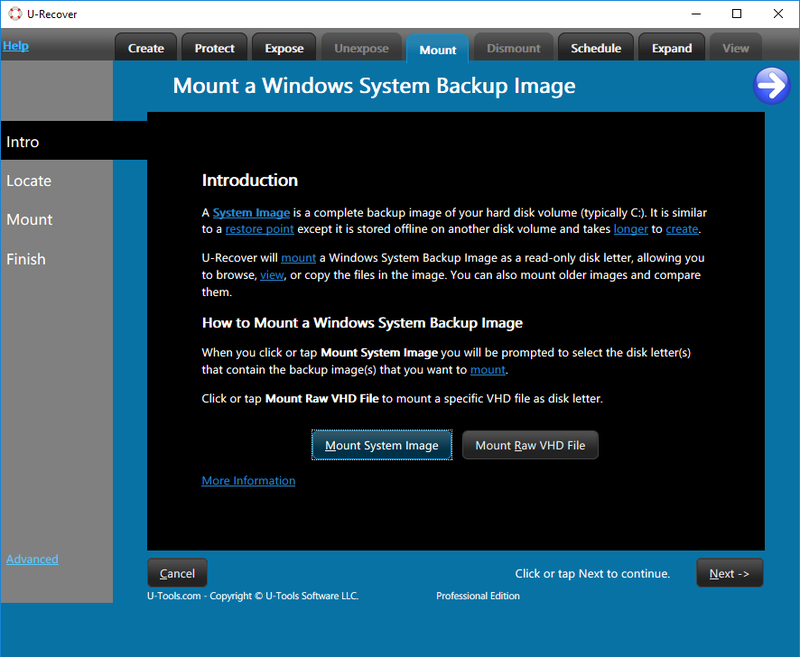 Access the previous version of a Virtual Hard Disk (VHD or VHDX file). For more information see the help documentation. You can download the free edition of U-Recover for personal home use. U-Recover Pro Edition offers flexible license options for your organization including bulk discounts for multiple copies. Copyright © 2019 U-Tools Software LLC. 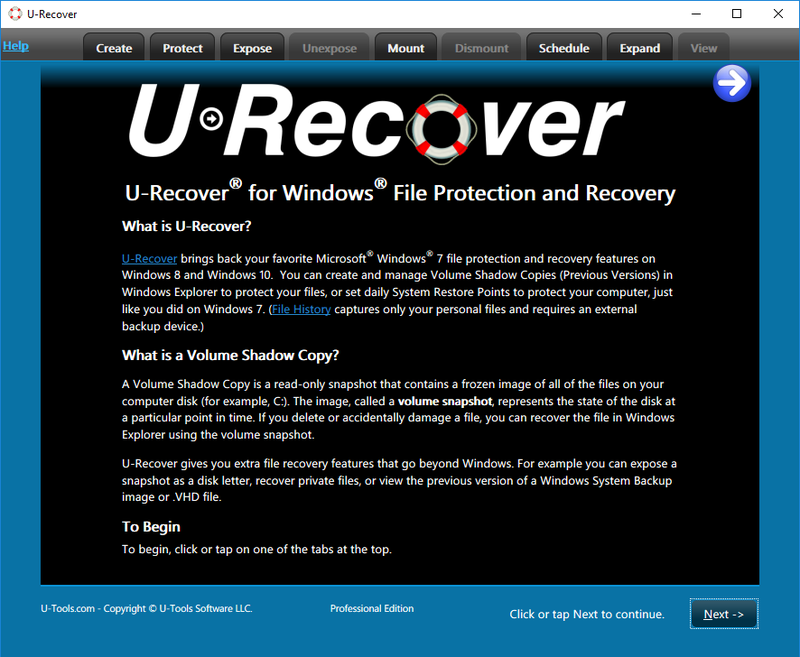 U-Recover® is a registered trademark of U-Tools Software LLC.